users are displayed using cards. 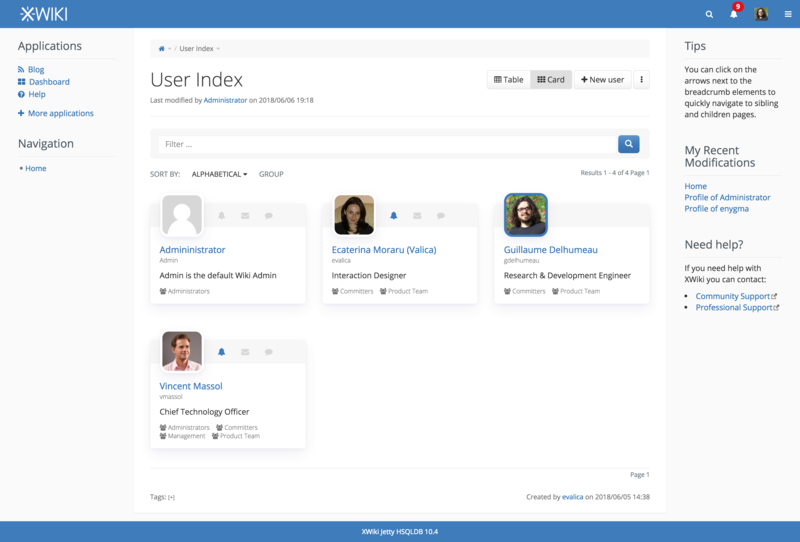 was to improve the UI of our User Index. card display, user groups display, etc. > users are displayed using cards. > was to improve the UI of our User Index. > card display, user groups display, etc. this is just wishful thinking. livetable is not necessarily good looking and suited for all the use cases. in a certain way, and currently that is proposed by using cards. > > users are displayed using cards. > > was to improve the UI of our User Index. > > card display, user groups display, etc. * What is the alert bell doing? * What is the bubble doing? Sending some message to a user? :) That looks nice. * What is the email icon doing? Sending some email to a user? We’ll need to implement that (not hard) since we don’t do this ATM. * Those are nice features which could be backported to the LT too as actions maybe? * IMO the filter should be a search with the full power of the search, just restricted to pages with XWikiUsers objects. Actually I would love to see a new layout for search results and have a search macro to be able to put the search on any page with the ability to configure not having the facets displayed and to specify the layout to use. It would be awesome too that the search would offer some UIXP to display a type of search results. For example here, based on the XObject type, find a UIX in the wiki that has the code to display a user object. If we could do this then this user directory view would only be a matter of using this search macro and we could use that in lots of other places in very nice ways. In summary this idea is a generalization of what you’re proposing. If I were to implement your idea Caty, I would explore implementing it this way. PS: I remember discussing this somewhere else but I don’t recall where. > this is just wishful thinking. > livetable is not necessarily good looking and suited for all the use cases. > in a certain way, and currently that is proposed by using cards. >>> users are displayed using cards. 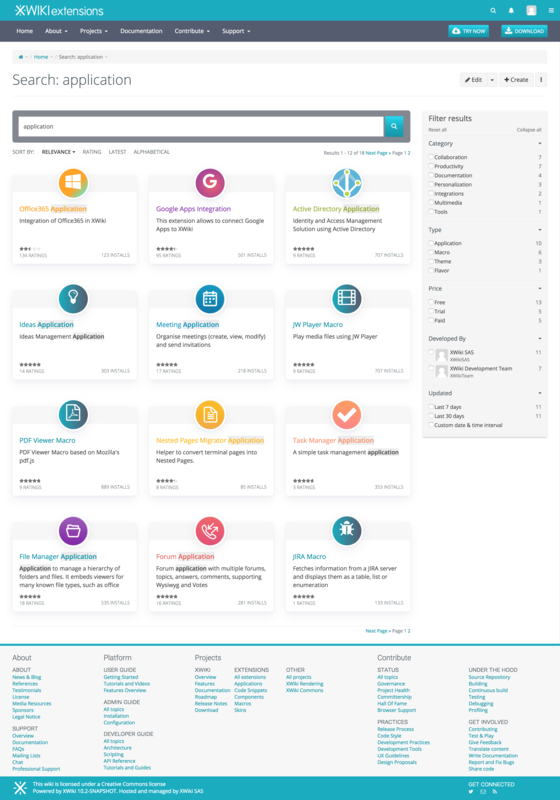 >>> was to improve the UI of our User Index. >>> card display, user groups display, etc. * Seems we would have some UIX to add 2 buttons in the edit menu and these UIX would have some conditions so that they’re only visible for the user directory page. It would be nicer to introduce a new Visibility scope for UIX and be able to register them with a page scope to avoid them being evaluated for every single page. > * What is the alert bell doing? > * What is the bubble doing? Sending some message to a user? :) That looks nice. > * What is the email icon doing? Sending some email to a user? We’ll need to implement that (not hard) since we don’t do this ATM. > * Those are nice features which could be backported to the LT too as actions maybe? > * IMO the filter should be a search with the full power of the search, just restricted to pages with XWikiUsers objects. > Actually I would love to see a new layout for search results and have a search macro to be able to put the search on any page with the ability to configure not having the facets displayed and to specify the layout to use. It would be awesome too that the search would offer some UIXP to display a type of search results. For example here, based on the XObject type, find a UIX in the wiki that has the code to display a user object. > If we could do this then this user directory view would only be a matter of using this search macro and we could use that in lots of other places in very nice ways. > In summary this idea is a generalization of what you’re proposing. > If I were to implement your idea Caty, I would explore implementing it this way. > PS: I remember discussing this somewhere else but I don’t recall where. >> this is just wishful thinking. >> livetable is not necessarily good looking and suited for all the use cases. >> in a certain way, and currently that is proposed by using cards. >>>> users are displayed using cards. >>>> was to improve the UI of our User Index. >>>> card display, user groups display, etc. with the icon with 2 states. Yes, the bubble would be for Send Message functionality in the future. came in mind where User Profile and User Index. > to implement that (not hard) since we don’t do this ATM. convenient. That was the logic behind the icon proposal. equivalent to LT columns that the Admin can select using the "Customize"
groups or even tags are used to mark individual teams, etc. > just restricted to pages with XWikiUsers objects. > configure not having the facets displayed and to specify the layout to use. > UIX in the wiki that has the code to display a user object. alternative layour for Search or even as an alternative for Livetables. > > this is just wishful thinking. > > in a certain way, and currently that is proposed by using cards. > >> livetable does ? > >>> users are displayed using cards. > >>> was to improve the UI of our User Index. > >>> card display, user groups display, etc. > evaluated for every single page. more of an exploration of what we should do in the future. > > * What is the alert bell doing? > > In summary this idea is a generalization of what you’re proposing. > > PS: I remember discussing this somewhere else but I don’t recall where. > >> this is just wishful thinking. > >> in a certain way, and currently that is proposed by using cards. > >>> livetable does ? > >>>> users are displayed using cards. > >>>> was to improve the UI of our User Index. > >>>> card display, user groups display, etc.